Anne Stadler helps people live well where they live. She supports the life force in every person, group, or situation, opening space for the emergence of spirited leadership and appropriate forms for collective evolution. Her work links people and place in a thriving flow. Since 1990, Anne Stadler has consulted with diverse groups, guiding the formation of emergent communities: for instance, as a founder and principal organizer of Spirited Work, an Open Space learning community of practice; with SOILIndia, a business school of inspired leadership, located in Gurgaon, India. 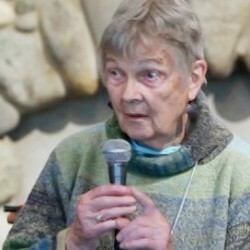 She is a pioneer of Open Space Technology and Appreciative Inquiry as well as other organic formats that open space for practical co-creative activity. Her work is especially suited for transforming crisis into opportunity, stepping into and designing evolving systems of governance, common life, and relationship that include maximum diversity and welcome emergent form and leadership. She has worked globally with many partners including corporations, cooperatives, educational institutions, arts organizations, foundations, non-profits and community groups. She is an Associate of the Sunyata Group. She has seventeen years’ experience as a multi-award-winning television producer, generating documentaries and special programs that illuminated community issues and were produced in collaboration with community leaders. Her work was the centerpiece of KING Broadcasting’s partnership with People Power, a broadly based coalition of groups that effectively helped to change Seattle’s community narrative. One high point of that work was City Fair, conducted in 1980 and ‘81. City Fair focused on living a high quality sustainable life in an urban setting. It brought together best practices from all over the country for a two week fair at the Seattle Center that opened during the national Mayors’ conference. KING-TV produced two documentaries, as well as many news stories, and public affairs announcements. City Fair’s practical impacts included: a community-wide recycling system, bike trails, Pea Patches for urban food growing; changes in energy policy and wide spread adoption of conservation methods; peer counseling in high schools. Anne’s television work also focused on international security. She developed and produced an award-winning series of prime-time programs that aired throughout the whole region. These were coupled with community discussion groups sponsored by People Power’s organizations. Anne was the American producer for KING-TV’s partnership with Gosteleradio (Soviet television), co-producing twelve programs that aired in the US and the Soviet Union, 1986—90 at the beginning of glastnost and perestroika. She has participated in founding many organizations that advance self-organizing healthy relationships among very diverse populations. She worked from 1960—1971 as a founder and director of a broadly based coalition to end war. She is a co-founder of Friends of Third Place Commons; Peacetrees Vietnam; the Open Space Institute of the United States; Journalism that Matters/Pacific Northwest Collaboratory. She is an advisor to Festival in the Workplace, an organizational transformation effort based in the Bahamas. She has been awarded a number of community service and professional awards. Among them, the B’nai B’rith Community Service Award, the Ralph Bunche World Peace Through World Law Service Award, the Center For Ethical Leadership’s Leadership Legacy Award. Her educational interests: She is certified in Transpersonal Psychology from ITP in Menlo Park, CA; and Radiant Breathwork with Gay ad Kathlyn Hendricks. She has extensive experience in Worldwork, an outgrowth of Process-Oriented Psychology; and studies the work of David Spangler (Incarnational Spirituality) and Angeles Arrien (cross-cultural anthropology). She has articles on the www.CollectiveWisdomInititive.org website, as well as on other obscure locations. She has a book in process: On My Way Home: Living in Open Space. She enjoys every minute of life with her family, friends, strangers and the natural world!